While the British authorities enjoyed the great financial benefits brought by the diamond trade, they also made it difficult to establish new factories. During these years, the industry was characterized by big factories, employing between 100 and 200 employees. The owners were businessmen who transferred managerial responsibilities to professionals in the field. 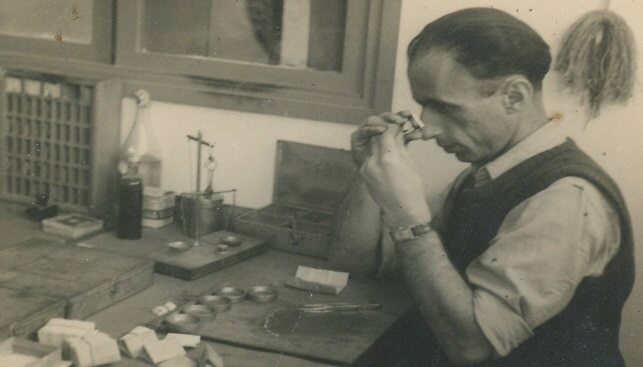 In 1944, Ovad Ben Ami established the Association for Polished Diamond Exporters in Eretz Israel. In 1944, initiated by Moshe Schnitzer, the “HaYahalom” magazine was first published. That same year, the first educational book about diamonds was published. “Diamonds” was written by Moshe Schnitzer and Elhanan Halperin. In 1945, there was a 50% slump in the price of polished diamonds. Many diamantaires suffered great losses, especially those who held large stocks in banks. In 1946, the Diamond Exchange Inc. was established. Following mass layoffs, most big factories in Israel were closed. More than 4,000 employees, accustomed to earning double or triple the average wage, were now unemployed. The industry was resurrected by a few wealthy businessmen, but mainly by the workers and professional managers who ran the factories. They reorganized in groups of 10-15 workers. Most factories asked De Beers for supply of rough, while the new groups began to buy rough in the open market. In 1947, the bourse and the Diamond Club moved to a building in 3 Ahuzat Bait St., Tel Aviv. In 1948, the bourse, the Diamond Club and the Association for Development of the Diamond Trade merged. The new organization numbered 800 members.